Kneseth Israel was the first congregation to be established by the Jewish community of Annapolis. The chronicle of our congregation history began over 90 years ago. At the beginning of the 20th century, a group of Jewish men decided to hold services in various homes in "Old Annapolis Towne"
Our Synagogue BuildingsThe first meeting place was a home purchased on Duke of Gloucester Street where services were held for ten years. In 1906, a home was purchased at 142 Prince George Street, remodeled, and converted into a small chapel. In 1919, we purchased a chapel from St. Anne's Church located at Prince George and East Streets. After considerable alterations, religious services were conducted there beginning the the fall of 1919. This synagogue served our Jewish community for 43 years. Prior to World War II, the Annapolis Jewish community found that the synagogue facilities were not large enough to take care of our needs for educational, social, and religious activities. The building at 117 West Street was purchased and after a complete renovation became the Jewish Community Center of Annapolis. In 1954, the synagogue merged with the Jewish Community Center. In 1956, we acquired the site of our present synagogue center and school, for we needed a new facility which would combine all of our services into one building. On January 20, 1963, we dedicated our current building on Hilltop Lane and Spa Road. The complex of buildings comprising of religious, educational, and social requirements are designed according to the teachings of Judaism. For over three decades, Rabbi Morris D. Rosenblatt and Cantor Rev. Henoch Hammer educated and influenced Jews in Annapolis and Anne Arundel County. Their warm and personal relationship with our membership, their love of Torah, and their devotion to teaching our Jewish children made a tremendous impact that has been passed from generation to generation. Rabbi and Esther Rosenblatt came to Annapolis in 1945 from Glouchester, MA. Rabbi Rosenblatt cared deeply about our congregants, and was always there for everyone. It was not uncommon for him to perform a wedding, officiate at the couple's son or daughter's Bar or Bat Mitzvah, and ten years later officiate at their wedding. Rabbi Rosenblatt also served as the chaplain for Jewish midshipman at the Naval Academy. He was also an advocate for civil rights in the community, and challenged a local beach that forbid admission to Blacks and Jews. Rabbi Rosenblatt retired in 1984, and was tragically killed by an intoxicated driver of a speeding car while crossing the street after havdalah on June 29, 1985. His lovely wife Esther passed away on October 15, 2009. 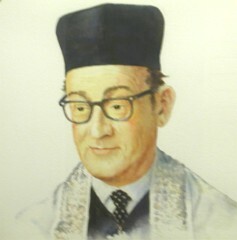 Cantor Henoch Hammer, better known as "Rev", came to Annapolis along with his wife Helen from Krakow, Poland in 1946 after surviving the Holocaust. For 33 years, he trained all of the boys and girls in our community for their Bar and Bat Mitzvah. No matter how off-key one might be for leading a service and chanting their Haftorah, Rev always got the very best out of each and every pupil. If a Bar Mitzvah lesson was snowed out, he would call the student's home and give the lesson over the phone. He was feared, respected, and loved by his Hebrew school students. Rev was very learned on Torah and Talmud, and his love of Judaism was an inspiration for all that knew him. Rev and his wife Helen moved to Brookline, MA in April 1997, where their son Michael, his wife Phyllis, and their four grandchildren live in nearby Newton. Helen Hammer died in June, 1997, and Rev. Hammer died in November, 2002. Below from left to right: Rabbi Morris D. Rosenblatt window dedicated in 1991, Jeffrey & Roberta Goldstein window dedicated in 1993, Henoch & Helen Hammer window dedicated in 1994, Myron Gordon window dedicated in 1997. The Rose and Bernard Legum Sanctuary has four beautiful stained glass windows. One window, dedicated in memory of Rabbi Morris D. Rosenblatt, was installed in July, 1991. The second window was generously donated by Jeffrey P. & Roberta Goldstein and family in September, 1993 in honor of their love and dedication to our synagogue and Judaism. The third window was installed in November, 1994 by Drs. Michael (of blessed memory) & Phyllis Hammer in honor of Michael's parents, Rev. Henoch & Helen Hammer. The fourth window, which depicts the exodus from Egypt by the Jewish people over four thousand years ago, was donated by Myron and Lenora Gordon in May, 1997. These colorful Judaic windows, which include an inscribed panel, will be there for future generations to enjoy and to appreciate. These beautiful windows add class, spirit, and beauty to our service. To maintain a synagogue which will serve as a center of worship, religious education, and study and communal needs. To foster Judaism not only in the synagogue, but also in the homes and lives of it's members and their families. To continue the teachings and practices of old in consonance with the needs of each new era of American growth and human history. Although Congregation Kneseth Israel has been around for 100 years and respected throughout the area, it's Lay leaders and Rabbinic leaders are concerned with today and tomorrow. Photo above from 1941 was taken at Kneseth Israel during a Passover seder for the Jewish Midshipman from the United States Naval Academy (photo courtesy of Gracia M. Littauer). Photo taken at the groundbreaking ceremony on October 19, 1961 for the new building and current location of Congregation Kneseth Israel. In the picture from left to right are Rabbi Morris D. Rosenblatt, Leon S. Kintberger, Stanley Berman, State Comptroller Louis L. Goldstein, Samuel J. Katcef, and Rev. Henry Hammer. The ladies with shovels are Cecily Greengold and Lena Eisenstein (photo taken by Morris Lieberman). 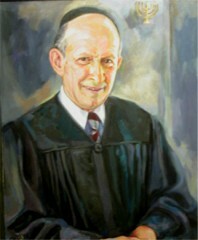 Above: (Cantor) Rev. Henoch Hammer, Nathan Schwartz, Rabbi Morris D. Rosenblatt, Stanley Berman, Alan J. Reiter, and Admiral Leon Kintberger at the 1961 dedication at the new synagogue building (Photo courtesy of Edward Wolfe, taken by Izzy Wolfe). Above: Photo of our beautiful synagogue courtesy of Mark Goldberg, Spectrum Productions.